In this edition of Anne Byrn's Taste of a Place column, the bestselling author explains why deviled eggs are the real stars of the Southern potluck, and offers not only a stellar recipe but a few tips to make yours magnificent. The most popular potluck recipe isn't fried chicken, potato salad or watermelon. It's deviled eggs. And that nugget of research data is my own, witnessed years ago at a massive potluck lunch in Kentucky. I was on tour to promote my book, What Can I Bring, and locals staged a huge, bring-your-own-recipe meal in my honor at the Berea library. Folks were asked to make their favorite potluck recipe, or to choose a recipe from my new book to make and share. And when I walked into a large conference room, where countless tables had been positioned end-to-end to accommodate the 100 or more home-cooked recipes, a majority of the plates held deviled eggs. 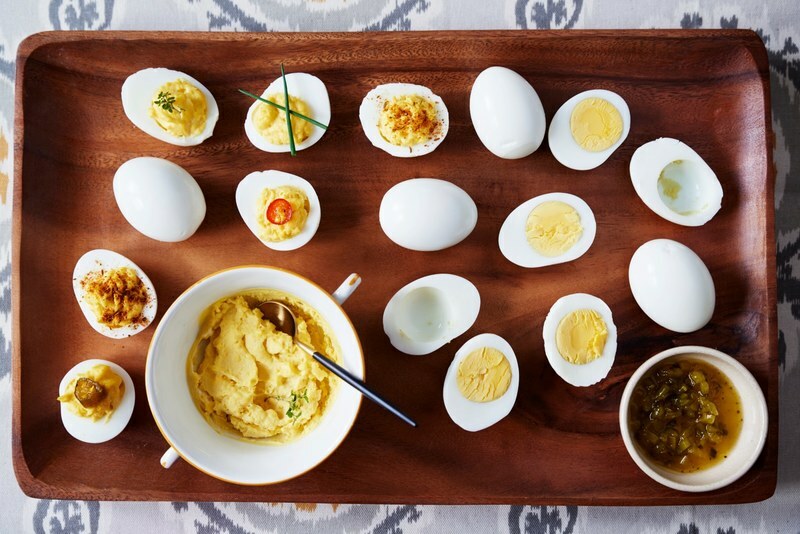 I knew that deviled eggs — or "stuffed" eggs as we called them in Nashville — were my personal favorite at a potluck, but I had no idea everyone else felt that way too. So I did a little research into how deviled eggs got to be so popular. The first mention I could find of a "deviled egg" recipe was in the 1877 Alabama newspaper called The Montgomery Advertiser. 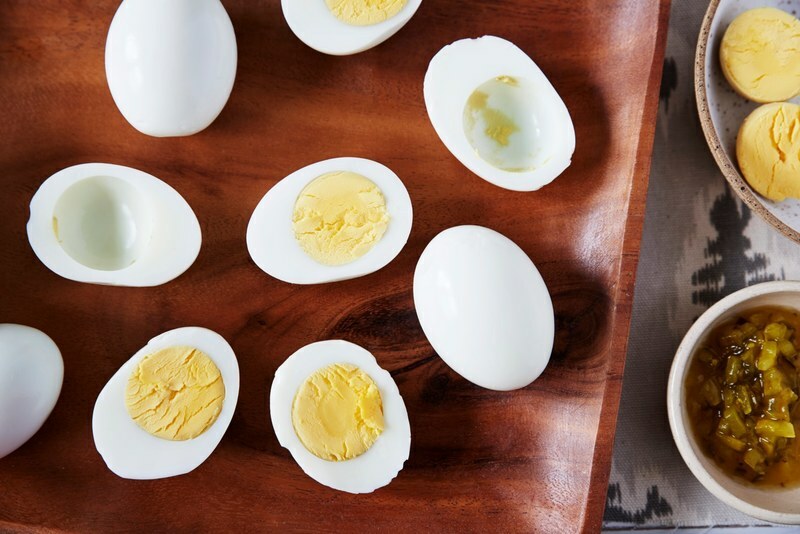 In August of that year, the paper shared how to make these delicious eggs: Boil six eggs for 10 minutes, rub the yolks with a little melted butter and some vinegar, cayenne, and dry mustard. Then spoon that mixture back into the shell. The recipe would circulate around the South for the next few months, and the following year it would appear in newspapers in Wisconsin, Illinois, and Indiana. Maybe it was their name, or their deliciously, and ever-so-slightly-spicy seasoning, but these "deviled" eggs were the big hit at early church picnics and suppers. And in fact, that piquant seasoning is precisely how they got their name, according to John Mariani in his book, The Dictionary of American Food & Drink. It was the spicy cayenne and mustard that also seasoned "deviled" crab. Mariani says the adjective "deviled" was first used in print in 1786, and by 1820 was used to describe spicy food. Washington Irving used "deviled" to explain a curry-like recipe in his Sketch Book. Deviled eggs became natural for outdoor entertaining. Once automobiles allowed Americans to take food with them, these church picnics and rides to the country for family reunions were good reasons to prep food and go. Cooks were advised to be frugal and economical in planning their moveable feasts. Save egg boxes, said Wanda Barton in her newspaper column "Home-Making Helps," of 1923. "They are fine for carrying boiled or deviled eggs." Nowadays, you can tote deviled eggs right on plates designed especially to keep the eggs in place. Or you can do as my cousin Margaret does: Line your serving plate with lettuce leaves and edible flower petals — it's beautiful! — to keep those eggs from slipping and sliding in transit. Based on my Kentucky research, there's a good chance someone will bring deviled eggs to the family potluck this summer. If that someone is you, here is a great blueprint recipe to follow, and many ways to make the recipe uniquely yours. Because deviled eggs are simply hard-cooked eggs in which the yolk is removed, mixed with mayonnaise and seasoning, and stuffed back into the halves of whites, they are easy to personalize. They are soft and creamy in texture, piquant in flavor, often a little sweet, and are a blank canvas when it comes to garnishing. The most critical part of their assembly is not over-cooking the egg. How long to boil an egg? You should never "boil" an egg. You want to place raw eggs in a saucepan in one layer and cover by an inch with cold water. Place the pan over medium-high heat, and let the water come to a boil, then immediately shut off the heat, or remove the pan from the burner. Cover the pan. Let the eggs sit in the hot water for 20 minutes. This way, they never "boil," which means the white stays tender and doesn't get rubbery. Plus, perfectly cooked eggs are easier to peel. Drain the eggs of water and run cold tap water into the pan to cool them down. Pull one egg at a time out of the pan, and under cold running water, knock the round end of the egg against the bottom of your kitchen sink and let the shell crack to break the interior egg sac membrane under the shell. Gently peel back the shell, run again under the water, then place on paper towels to drain. Repeat with the remaining eggs. I have found it's easier to mash the yolks with seasoning while they yolks are still a little warm, and the texture of the filling is always smoother, too. As for mayonnaise, use your choice. Mine is Duke's because I find it less salty than Hellman's. And Miracle Whip is just too sweet for me. As for add-ins, use your judgement. For a sweet, traditional deviled egg, add pickle relish. For a less-sweet more-European style, omit the relish and garnish with chopped fresh herbs. No deviled egg must be created alike — follow the recipe below, or change it up completely! Regardless how you top them, count on serving one egg per person, which yields two halves. Enjoy! Place the eggs in a large saucepan and pour in enough cold water to cover them by a couple of inches. Place the pan over medium-high heat and bring to a boil. Cover the pan and remove it from the heat. Let the eggs stand in the hot water for 15 minutes. Drain the water from the pan and immediately fill it with cold water. Remove the eggs from the pan and gently tap them to crack them. Peel the eggs under cool running water, starting at the large end. Slice the eggs in half lengthwise; remove the yolks with a teaspoon, and place the yolks in a small bowl. Set aside the whites. Add the mayonnaise, pickle relish and mustard to the yolks and mix, mashing the yolks with a fork. Season with salt and pepper to taste. Add more mayonnaise or some of the sweet pickle liquid if the yolk mixture is too dry. Spoon the yolk mixture into the hollows of the egg whites and place them on a serving plate. For a fancier look, spoon the egg yolk mixture into a resealable plastic bag, snip off one corner, and pipe the mixture into the hollows of the egg whites. Sprinkle the tops of the eggs with paprika, a slice of pepper or parsley. Serve. Anne Byrn, a New York Times bestselling cookbook author and writer, is the former food editor of The Atlanta Journal-Constitution and author of the popular Cake Mix Doctor series and most recently, American Cake. Her newest book, American Cookie, is available from Southern Kitchen. Anne lives in Nashville, TN, her hometown. Visit her at AnneByrn.com.